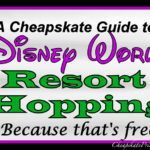 I love resort hopping at Walt Disney World. 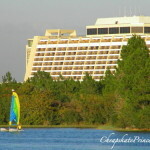 If you have a couple of free hours on your next Disney vacation, there may be no better place to spend some time than Wilderness Lodge Resort. One of the best reasons to visit this specific resort, perhaps more than all the others, is all the free things you can find to do inside the lodge. It’s hot in Florida for a large portion of the year, and inside the Lodge is cool and shaded. Use our guide to all the best FREE activities the Lodge has to offer. Sit at the fireplace in the rocking chairs. 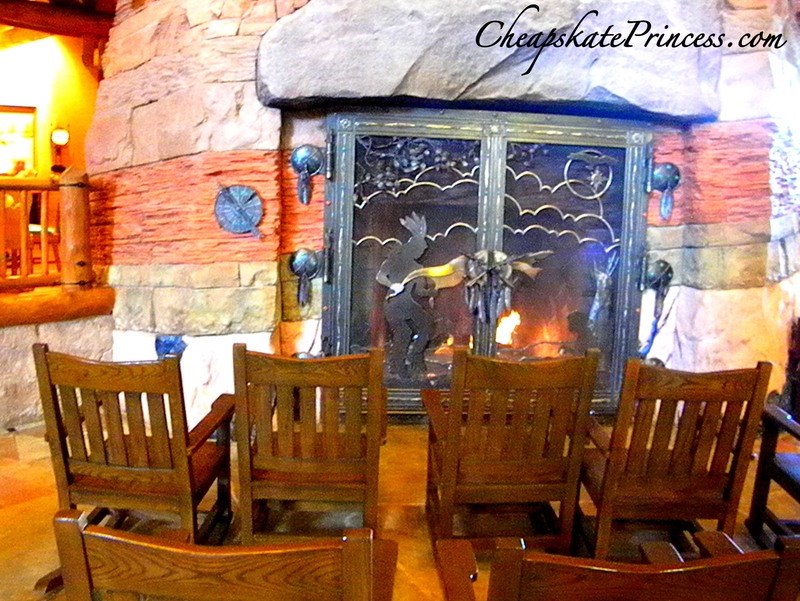 I’m not sure I have ever seen a fireplace as tall as 82 feet, which makes it as high as Chickapin Hill over at Splash Mountain in the Magic Kingdom. The rock-work layers, showcasing nearly 100 colors, represent nearly two billion years of the Earth’s history that are exposed in the rock strata of the Grand Canyon. I hiked the Grand Canyon back in my reckless youth, so let me tell you from experience, looking at these rocks from a rocking chair is much less painful. Scoot up close and see if you can spot any fossilized plants and animals on the stones. 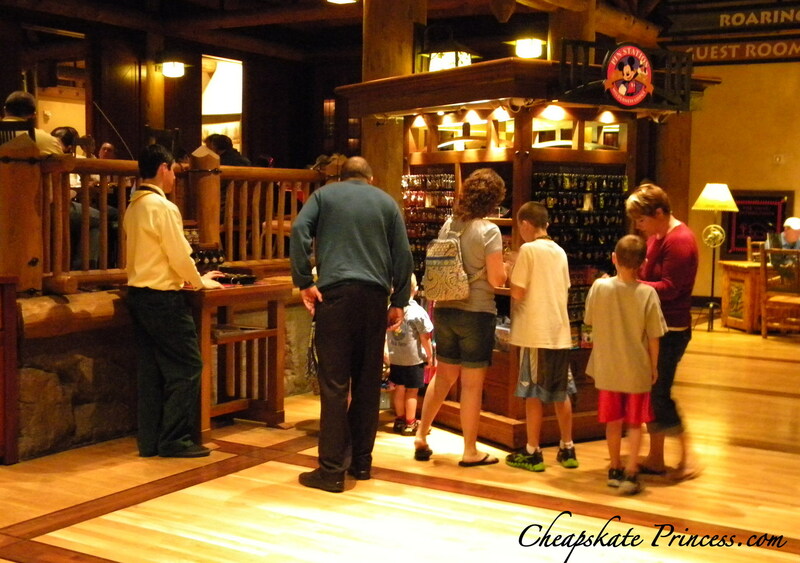 Wilderness Lodge offers one of my personal favorite gift shops on Disney property. It is not the largest shop by any means, but the theming is almost as excellent as the lobby. 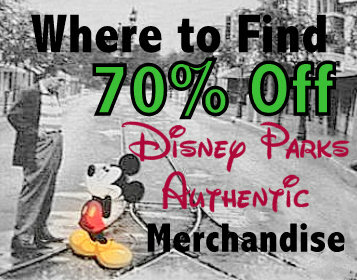 If you are a DVC member or just a Vacation Club fan, there is a nice collection of DVC merchandise available for purchase, or you can just walk around and window shop. 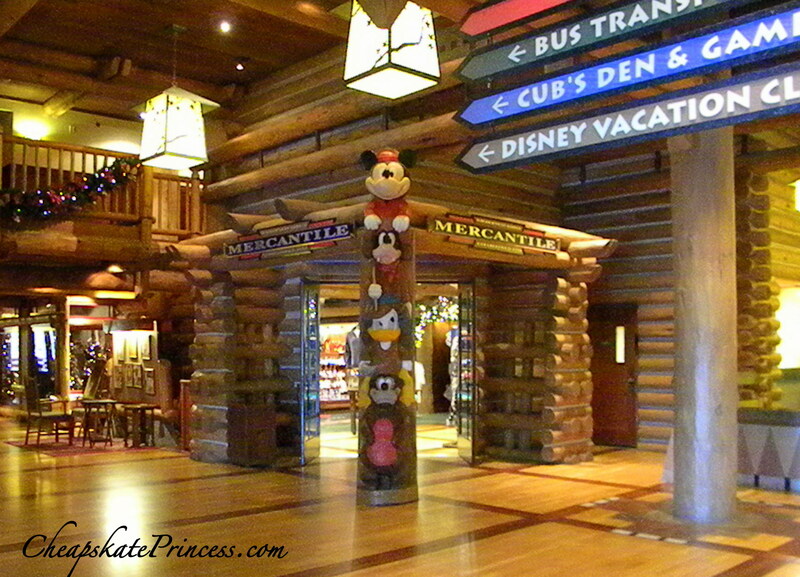 The Disney character totem pole at the shop entrance is a photo must-do. If you enjoy Disney history, you probably know that Walt Disney was fascinated with steam trains. Wilderness Lodge is the host of a mini-museum of art, photographs, replicas, and actual artifacts from Walt’s hobby and Disney World’s earliest years. Just looking at the train memorabilia makes you feel a bit closer to Walt Disney, the legend. 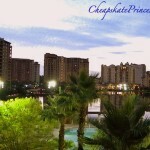 To see the collection, walk over to the Vacation Club Villas and take a look around. It’s under a two-minute walk from the gift shop. In a corner of the Villas building at Wilderness Lodge in the Carolwood Pacific Room, you can spend the afternoon playing chess, sitting by the fireplace, or learn more about Walt Disney’s favorite hobby. This is a lovely, relaxing area of the Lodge. Pull up a chair by the fireplace and be sure you notice the fireplace screen featuring ironwork trains. While this little section is no secret, I feel like I shouldn’t be telling you to go here so that it remains more of a secret. But years ago somebody shared it with me, so I’m doing the same for you. 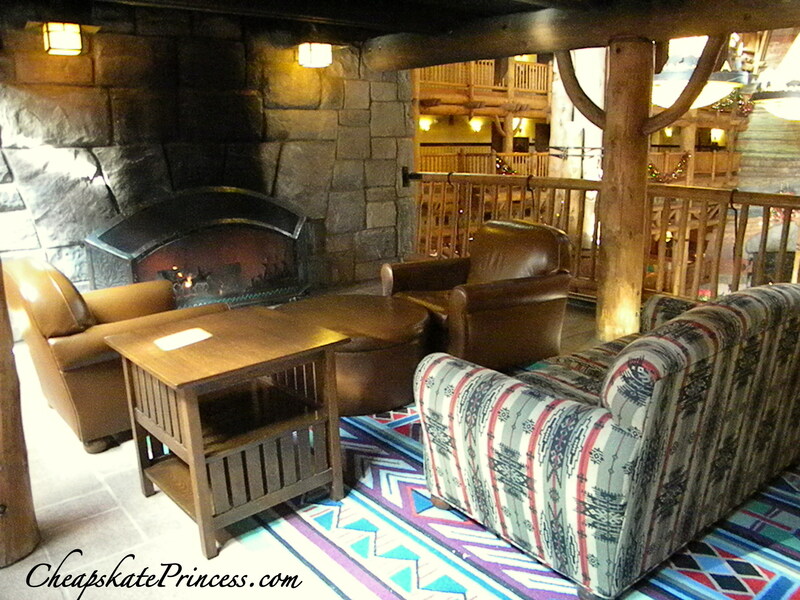 It’s probably my favorite place to sit in the entire lodge, my absolute favorite little spot. 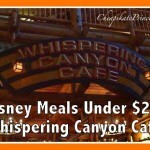 By the front door, on the side of the Whispering Canyon Cafe and the front bathrooms, take a walk up the stairs to the second level. There is a quant little sitting area with a fireplace that allows you some peace and quiet from the crowds in the lobby, but you can still hear enough of the hum of happy vacationers to feel the joy. We usually pick up a snack and have a mini-snack-picnic here by the fire. Right around the corner from this sitting area by the 2nd floor fireplace is a craftsman style table. This is a great little spot to eat a snack or sit in a quiet place to do some texting or write a letter/post card to a friend. You are just above Whispering Cafe at this location, yet out-of-the-way from the crowds that move through the lobby each day. When you step into the seven story lobby, you will immediately notice two towering totem poles. Each hand-carved pole is 55-feet tall, one topped with a raven and the other with an eagle. 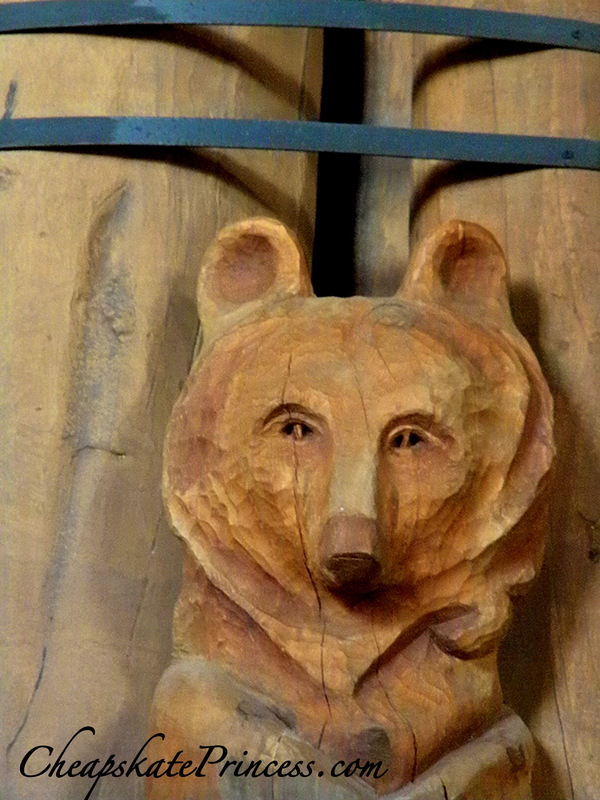 All the animals carved into these totems depict Native American myths and legends. Grab your camera and position the kids for perspective in the picture. Do this every year to see how much they have grown, which probably sounds more exciting than getting in the picture so you can compare how much you’ve aged. In case you missed it before, walk back over to the Wilderness Lodge Mercantile to see the 10-foot totem pole with carvings of Donald Duck, Goofy, and Mickey Mouse. Meet in the Wilderness Lodge to take The Wonders of the Lodge Tour, offered Wednesday through Saturday at 9 a.m. On the tour, a Wilderness Lodge guide walks the lodge with you, providing information about the Lodge that few visitors know. 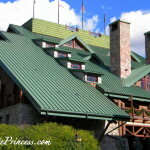 I would phone the lodge before your arrival to make are the tour is still being offered. Events are changed all the time without notice. 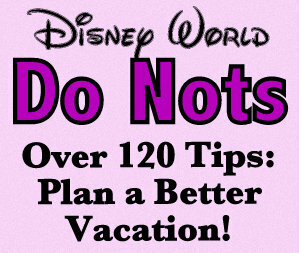 Stop by the front desk when you arrive at the Wilderness Lodge and ask for a Hidden Mickeys Hunt. 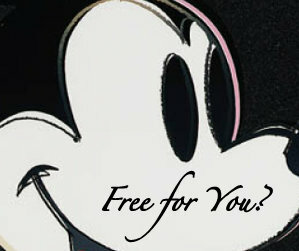 You’ll be given a paper with clues to find all of the Hidden Mickeys located throughout the Lodge. 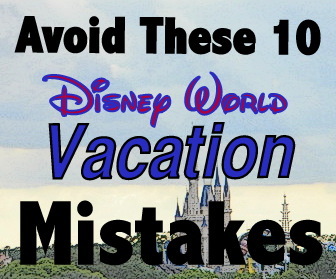 If you don’t want to take the cheating route with easy answers, you can simply hunt for the Mickeys without the guide. 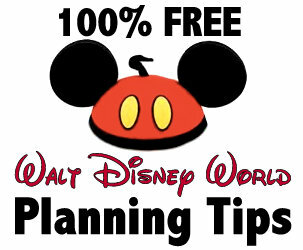 Kids and many adults love looking for those Hidden Mickeys. 10. Go on a Bear Hunt! 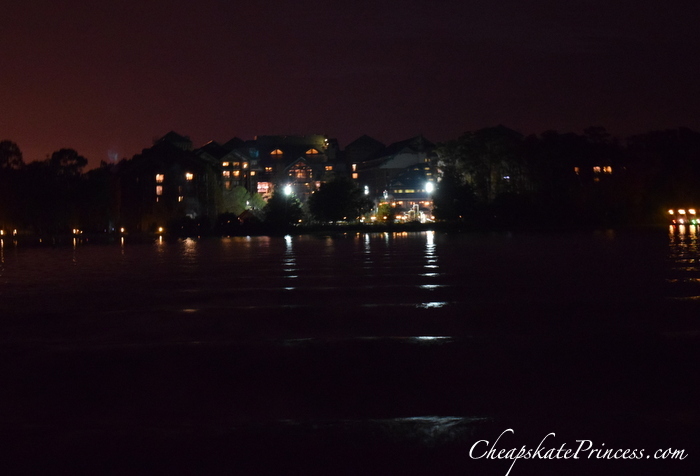 If you are on a boat approaching the resort, a Cast Member told me the windows also seem to resemble a bear face…don’t forget to look as you approach the lodge from the water. Check it out – it looks like this! Take a seat in the lobby and people watch. Disney World is a fascinating melting pot of people from all parts of the world. Sitting in the lobby, you will hear languages foreign to your ears, and you’ll see t-shirts from countries far away. 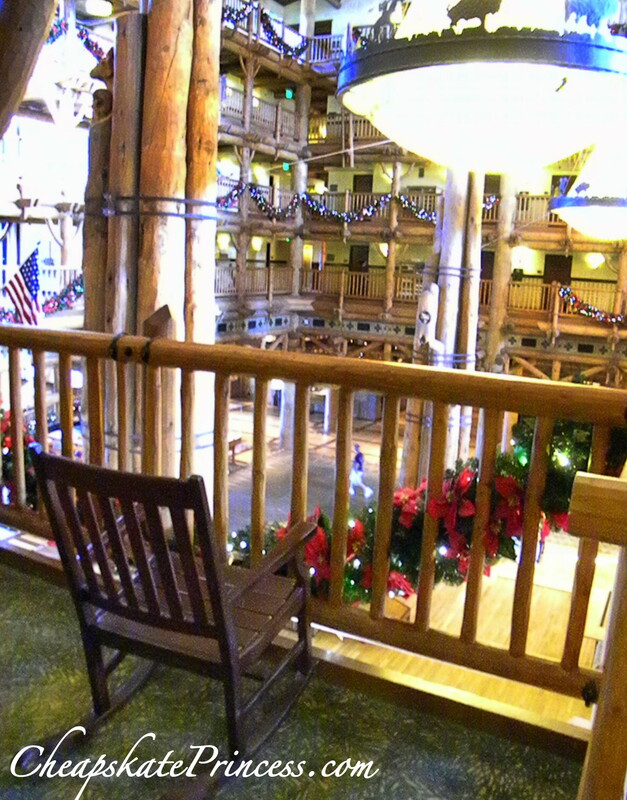 Watch the children run, listen to the whooping sounds of glee coming from Whispering Canyon Cafe, and just relax as people stroll by. 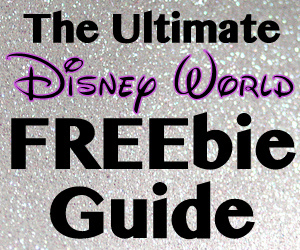 If you have already purchased Trading Pins, do some free trading. The Trading Post at Wilderness Lodge has one of the few large pin trading books that I can find on Disney property anymore. Cast Members are always friendly here, and they are standing right next to the hollering and singing at Whispering Canyon Cafe, which is sure to keep you in a festive vacation mood. 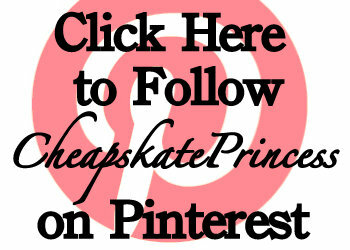 Buying pins isn’t free but trading is! As you walk toward the back of the lobby, there is a little bridge by a hot spring. 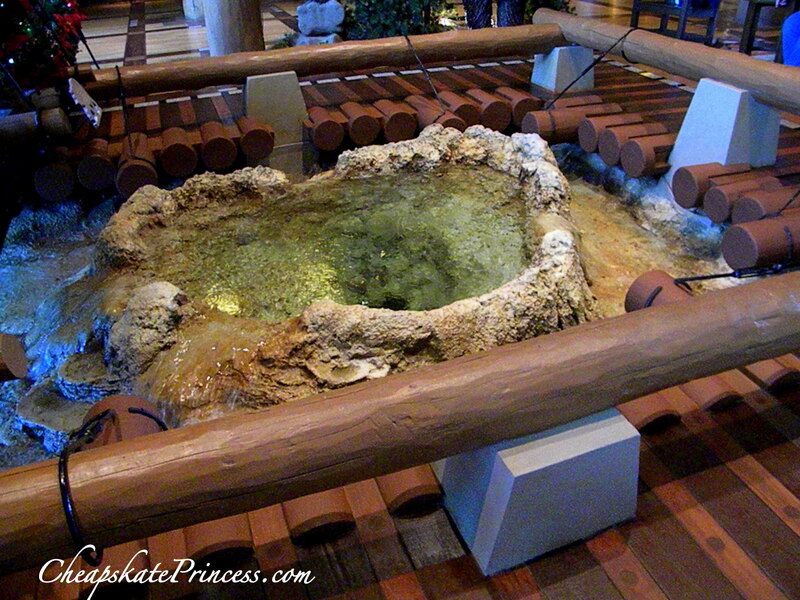 This is the beginning of Silver Creek, bubbling up from the lobby and flowing down through Wilderness Lodge property. Flowing over Silver Creek Falls and into Silver Creek Springs Pool, the creek appears to trickle off into Bay Lake. This is man-made, so it’s pretty neat to follow an indoor spring outside. Look up! 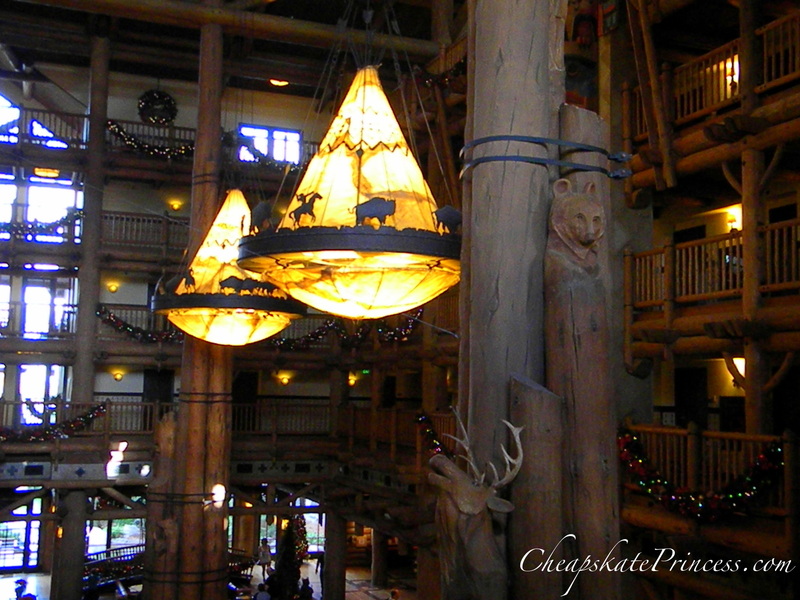 There are four huge teepee-shaped chandeliers suspended from solid Lodgepole Pine beams. 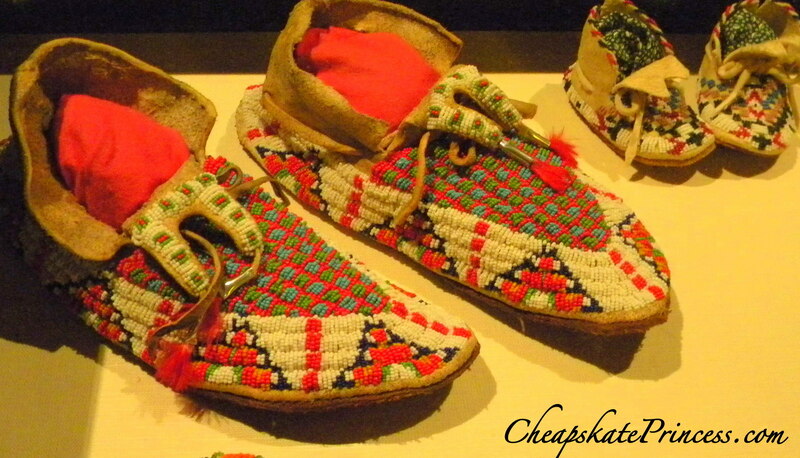 Authentic rawhide is hand painted with geometric designs. Each of the chandeliers, with bronze and steel rings of silhouetted buffaloes and riders on horseback, weighs a hefty 600 pounds. Look down! 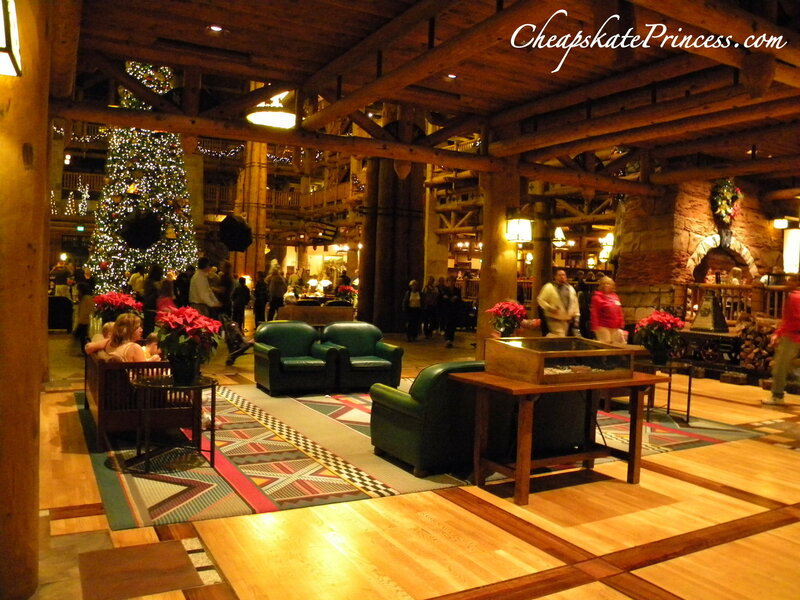 Disney’s Wilderness Lodge lobby floor has an inlaid pattern made from four different types of wood including Brazilian Cherry, White Oak, Bird’s-Eye Maple and Burl Walnut. The floor’s main design depicts the symbol of unity among wildlife, man, the cosmos and the four seasons. 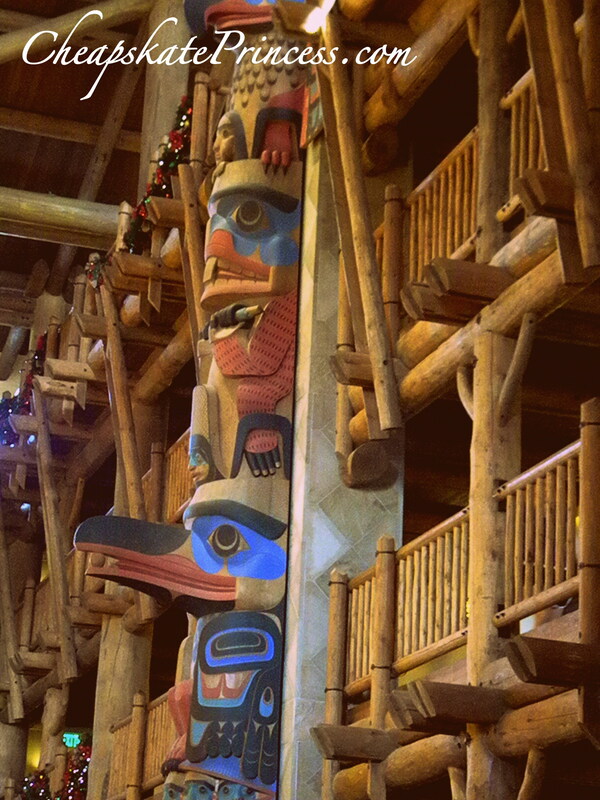 Artifacts from a variety of Native American tribes, including the Cheyenne, Crow, Sioux and Blackfoot, have been collected, re-created, and displayed throughout Disney’s Wilderness Lodge. Authentic reproductions of headdresses, painted robes and drums, as well as work from artists noted for their reverence for nature, can be seen in the lobby’s secluded alcoves and throughout the resort’s restaurants and sitting rooms. 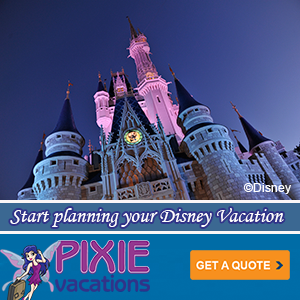 You will have to vacation during November through early January to see the spectacular Christmas decorations. 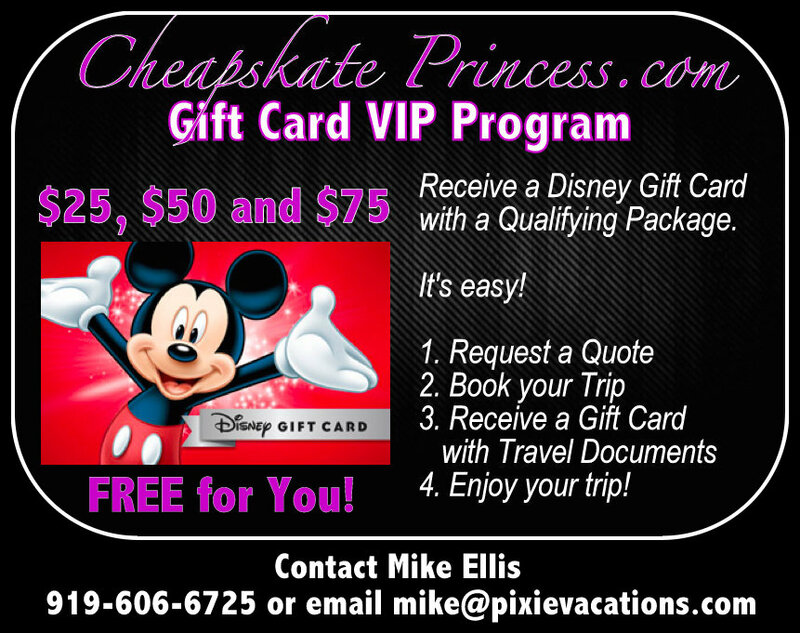 This is a busy time of year to visit Orlando, but that makes visiting during the Christmas season all the better. 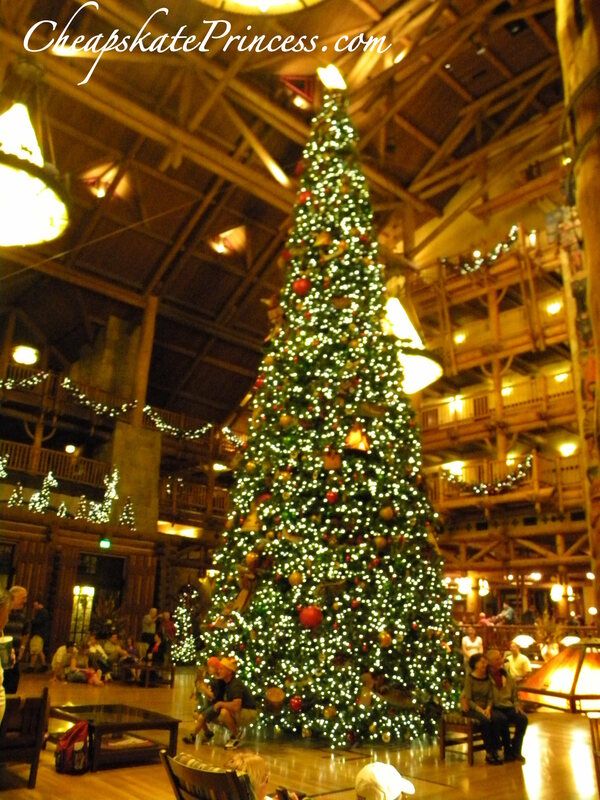 When the theme parks are packed out, relax by the incredible Christmas tree. 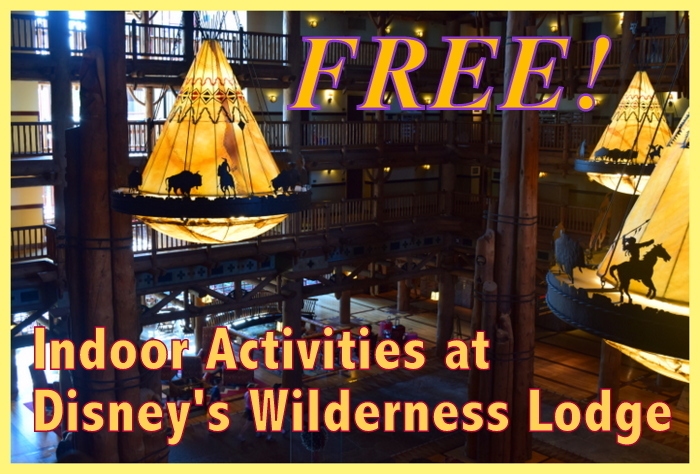 Like to take a look at some paying activities at Wilderness Lodge? 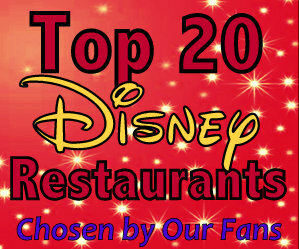 Use this link to the Disney World Wilderness Lodge recreation page. 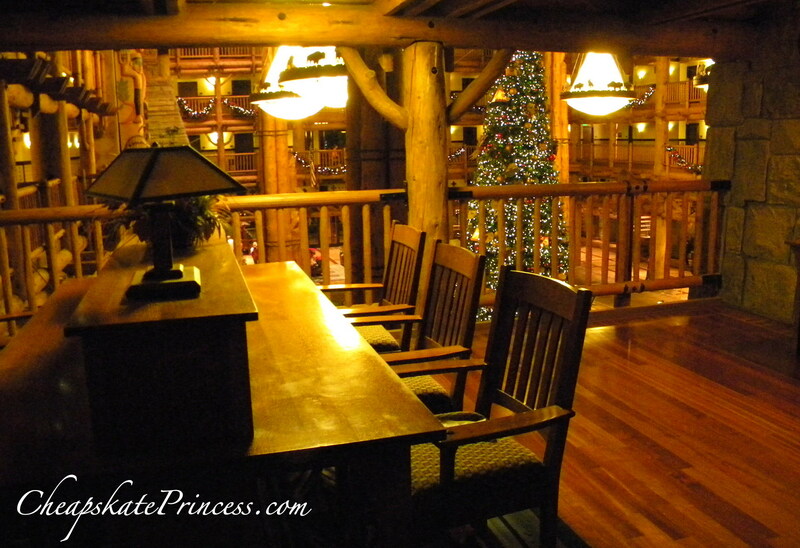 Like to know more about Wilderness Lodge? 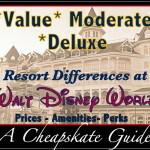 I found a lot of this information at Wildernesslodgesite.com. 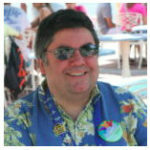 This unofficial tribute site has all sorts of historical information, great photos, plus unusual and interesting facts.